It can sometimes to be difficult to decide what to include in an apartment dwelling, when size constraints need to be factored into decorating decisions, but with a decent floorpan available and a clever designer on hand, the sky's the limit as to what can be achieved! 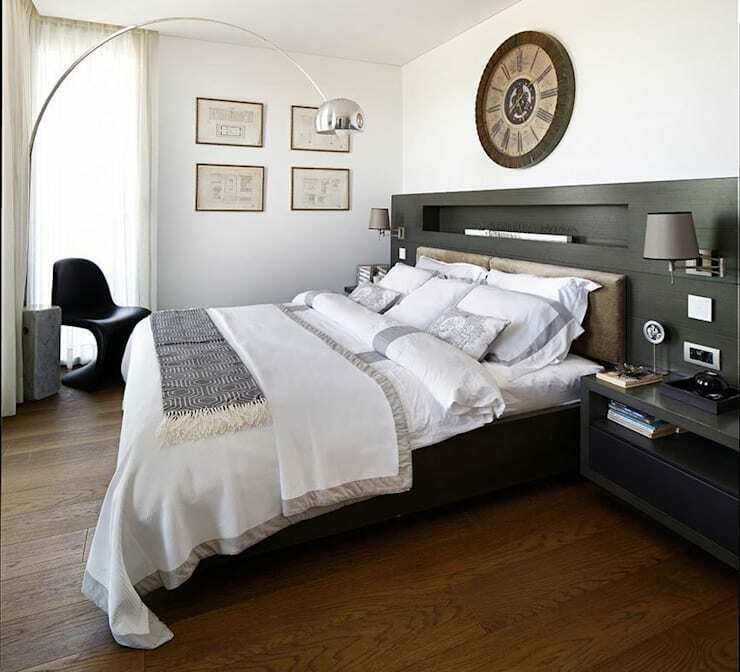 This fabulous family apartment is located in Istanbul, and is the brainchild of Esra Kazmirici Mimarlik Interior Designers and Decorators, who have managed to pack a whole lot of style and luxury into its various rooms. Upon entry we're embraced by a stylish and eclectic living room, with an engaging range of textures, materials and decorative features on display. An expansive array of storage makes room to house a host of decorative objects, while luxurious touches such as a white marble fireplace and dining table, and a vintage leather couch, lend character and sophistication to the room. The home's kitchen is spacious and light, with sunshine pouring through its large windows, illuminating the classic decor of wood and white as well as a large dining setting, primed to accommodate a casual meal. The bedrooms also benefit from their own unique sense of style, with a sumptuous master bedroom dressed in the deep tones of timber and a playful and creative children's room both included. The jewel in the crown of this amazing apartment however, is perhaps the sunroom, which has been enclosed on the home's upper level and present a relaxing and tranquil space in which the occupants can unwind in large or small groups. Take a tour below and tell us what you think! 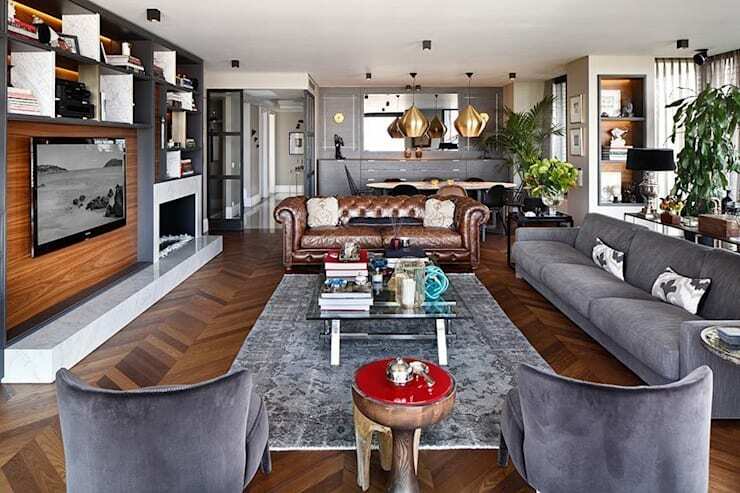 Upon entry to this amazing apartment we're met with a beautifully decorated living space bursting with eclectic style. The range of materials and finishes displayed might almost be overwhelming had the designers not chosen to cleverly constrain their eclecticism within a palette of brown, grey and white. The flowing parquetry floor elongates the room, while a range of sofas lay in way to facilitate relaxation and casual entertainment. A vintage, leather sofa sits pride of place at the far end, regally drawing focus within the living area, and adding a touch of luxurious sophistication alongside the sleek surface of the white, marble fireplace. The room also houses a generous array of storage on which the occupants can display a host of decorative or personal objects. 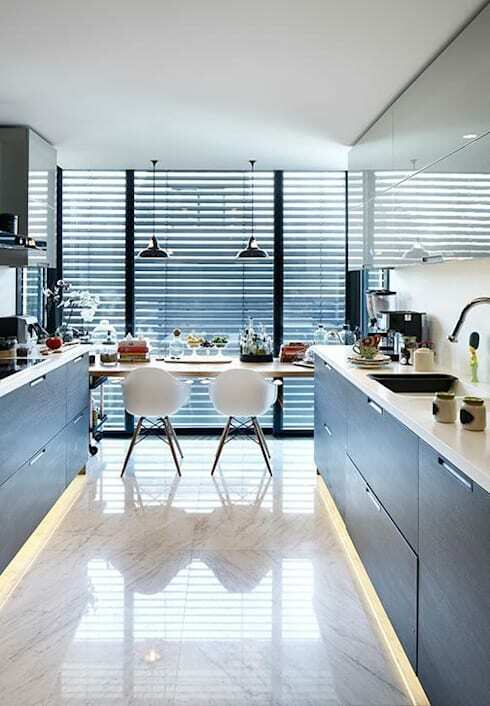 Shelves, draws and tables border the room, each beautifully lit by sun streaming through the home's large windows. Behind the living space is this elegant locale for dining or relaxed entertainment. The oval shape of the table adds a delicate feel, which contrasts beautifully against the strength of its white, marble finish. 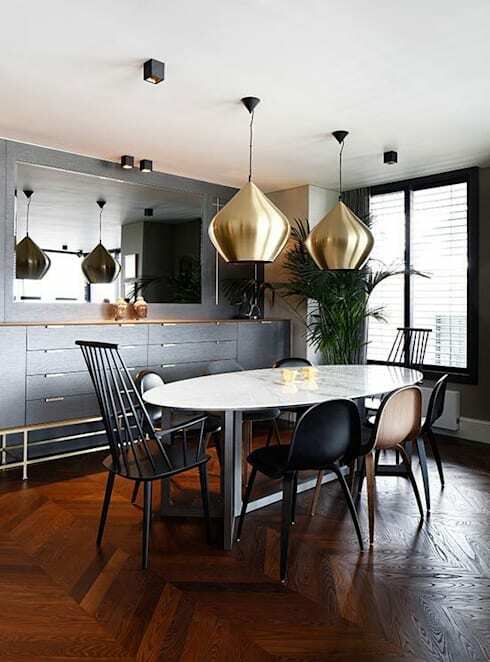 Bulbous, brass lamps hang overhead, ready to provide localised ambience, while the dining chairs are stylish and modern, with subtle shapes and tones so as not to detract from the beautiful table at their centre. Moving through to the kitchen and we're met with a light and open space, benefitting from its own set of expansive glass panels. White marble tiles flow underfoot, laying the foundation for a luxurious atmosphere, while wood cabinets and white bench tops construct a classic kitchen interior. In the distance we can see an expansive banquet table, set for a relaxed feast in the streaming sun, and suitable for both casual and formal dining. 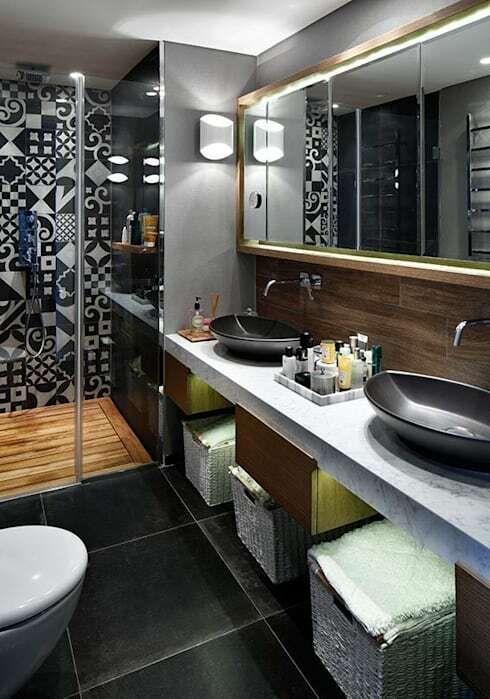 The home's bathroom also incorporates a number of elegant, luxurious features, all the while spiced up by an array of patterned tiles lining the shower unit. The dark tones of the wood trim and black tiles within the room add depth to the space, while a white marble sink unit adds a sense of luxury and ties beautifully with the marble finishes featured throughout the remainder of the home. Twin, oval sinks contribute a modern edge, while the wooden floor of the shower unit seeks to incorporate an element of classic Turkish bathing within this sophisticated and engaging bathroom. The home's master bedroom is sumptuous and inviting, with this voluminous bed bathed in sunlight teasing us with the offer of supreme relaxation. The majesty of wood is prevalent within the room, with the deep tones of its wide floorboards streaming underfoot, and the expansive bedhead and shelving stretching out proudly against the far wall. A rustic clock hangs overhead, keeping time amidst the room's more contemporary touches, such as the long-stemmed, silver reading lamp stretching over from its magnificent, marble base. 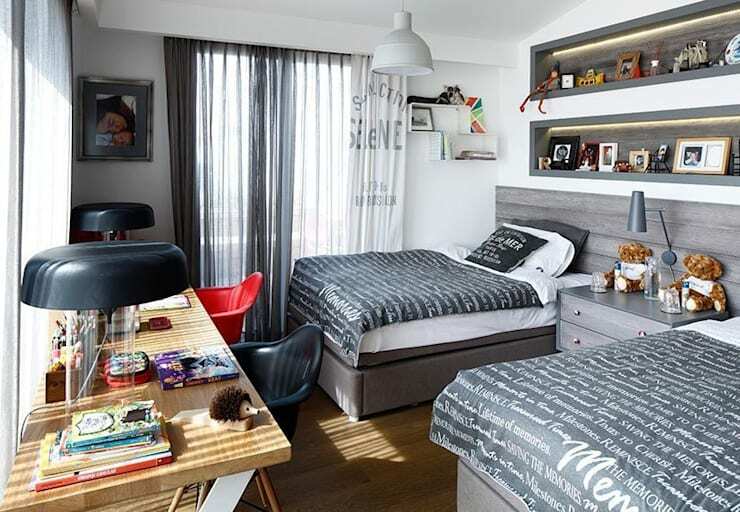 This being a family apartment the designers have included a lively and playful room for children, with two single beds and ample storage to house toys, games and other activities. Large windows frame the space, meaning that the children can play and create in the midst of streaming sunlight, while the understated palette of grey and white has been dressed up by decorative bed spreads and personal objects displayed across the desk and shelving units. While the downside to apartment living is often the lack of a garden space or back yard, this marvellous home includes a happy alternative. This sunroom has been constructed, in which the occupants can relax in peace and tranquility as sunshine filters through the windows overhead. The room is populated by banana lounges, low-lying chairs and a timber bench, meaning that it can accommodate a spate of quiet relaxation or a more lively gathering, depending on the need. 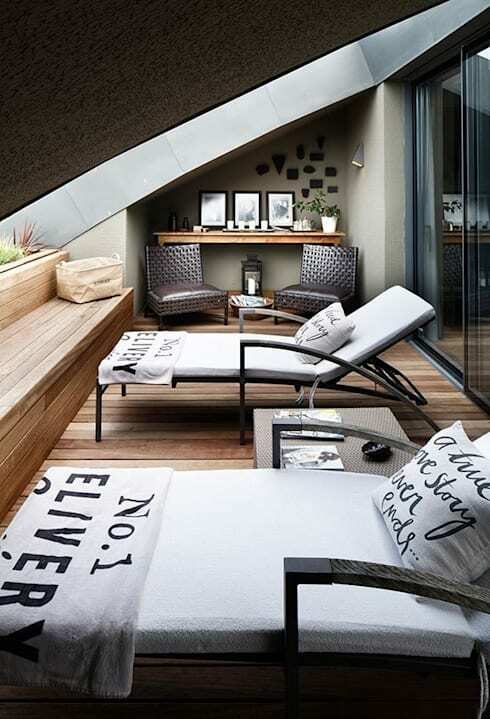 Did you like the novel sunroom in this amazing apartment? Then have a look at How to make the most out of your small garden for ideas on how to transform a small space into a tranquil getaway! What do you think of the sunroom included in this fabulous dwelling? Tell us your thoughts below!